The first part of the year is birthday season in my family. My birthday in January, then both of my parents in February, then my sister in March. My brother- and mother-in-law also have birthdays in the early part of the year. We used to have a separate birthday dinner for each person, but in recent years we’ve decided to double up or combine celebrations to accommodate many people’s schedules (and basketball season). This year, my parents and I (and Bill and Caelan) got together to celebrate my birthday (4 weeks late), my dad’s birthday (1 week late), and my mom’s birthday (1 week early). I wanted to make a cake, but since mine was one of the birthdays that we’d be celebrating, I decided to go with just a “cake” rather than a “birthday cake”. Boston Cream donuts are my favorite and I’d never tried to make a whole pie before, but this seemed like a good time to give it a shot. I made a half-assed attempt at Boston Cream cupcakes awhile back, but this time I used an actual recipe and made real pastry cream. Or attempted to do so. I made the pastry cream (I used the recipe from this post on Annie’s Eats) the night before I was going to assemble the cake and put it in the fridge overnight. I was disappointed the next day to find that it didn’t set up and was unusable. The pastry cream is essentially a custard and custards are definitely tricky, but I’ve made them many times before (in the form of crème brûlée) and was successful. Anyway, I didn’t have time to risk another attempt (and I’m not sure exactly where I went wrong), so I looked around my kitchen for something to improvise with and I came up with a mixture of french vanilla pudding mix, milk, Cool Whip, and a tiny bit of vanilla extract. It was passable (though actually less so after being chilled). Then I made the frosting (dark chocolate ganache) and though I’ve made it several times before, I had issues with this too! It was too thick to spread so I kept adding half-and-half to make it manageable. The cake tasted good (though I’m less and less enamored with that recipe the more I make it – I should try a new yellow cake recipe) but it wasn’t a real Boston Cream pie. So it looks like I will be making a 3rd attempt at this at some point because I really want to get this one right!! 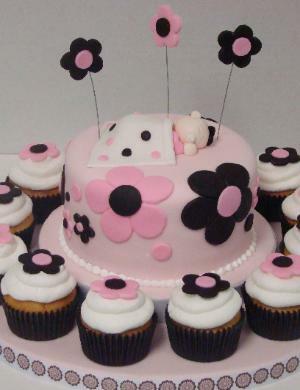 A fellow Nestie, Kathryn, asked me to make a birthday cake for her daughter’s 2nd birthday in mid-December. She asked for a half sheet cake with 3D butterflies. Prior to this cake, I only owned one 11×15 cake pan because I wasn’t sure it’d be worth it to have two. 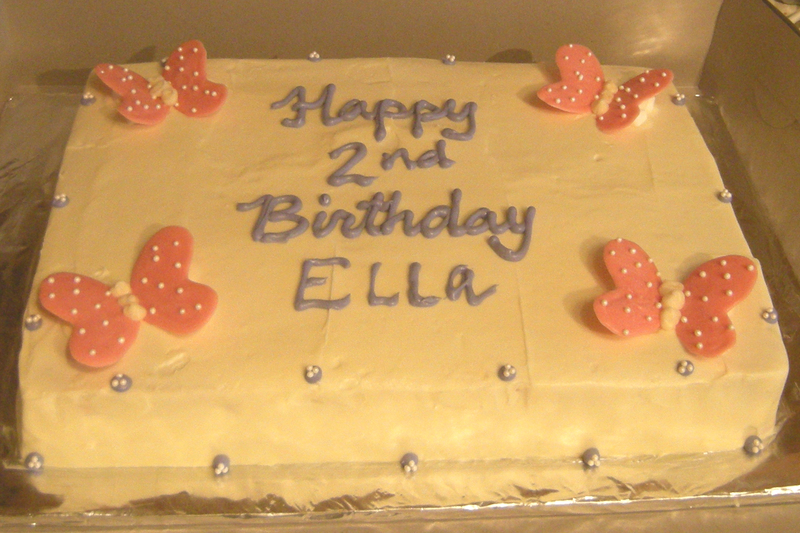 But being able to bake two at a time is definitely a time saver, so I picked up a second pan before I made this cake. I made 2 recipes of a basic yellow cake (one for each pan), plus a single recipe of chocolate ganache for the filling, and a triple recipe of cream cheese icing to cover the cake. For the butterflies, I used a technique that I’ve used before from Hello, Cupcake! – and instructions from Annie’s Eats. I used pink candy melts to make the wings, and then I sprinkled on some pearl decors. I used mini marshmallows to make the wings stand up on the cake. I had some left over yellow cake cupcakes from another project (see next post) so I thought I’d try to throw something together to resemble Boston Cream cupcakes. I mixed up a box of vanilla pudding and made a basic chocolate ganache. 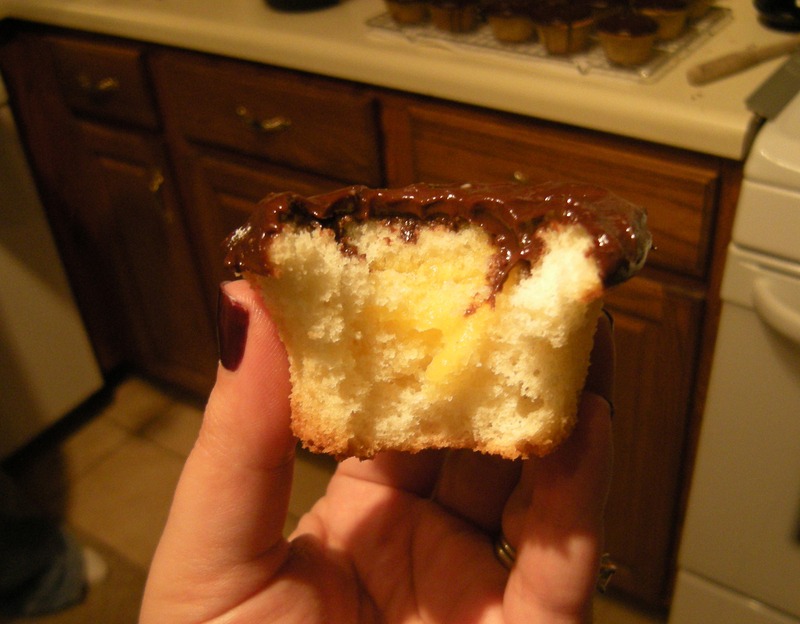 I used the cone method and filled the cupcakes with the vanilla pudding. I had planned to dip the cupcakes in the ganache to create a nice smooth top, but since I had cut into the top to fill them, the top was not smooth after the dip. So then a spread a (lumpy) layer of ganache on top. Going from bad to worse here. Finally I dusted the top with powdered sugar to try to detract from the icing job, but that wasn’t a good idea either. So these cupcakes, while they tasted perfectly fine, were a FAIL from a decorating standpoint. They also were a poor imitation of real Boston Cream. I’ll make another attempt at these at a later date and make the cream from scratch rather than using filling – maybe that will help! 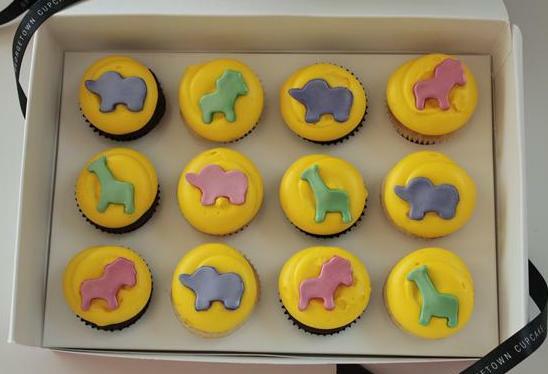 Yesterday morning I delivered cupcakes to my first repeat customer! I asked my husband if that was a good sign and he assured me that it is! Tyler showed me these inspiration pictures from Georgetown Cupcake. 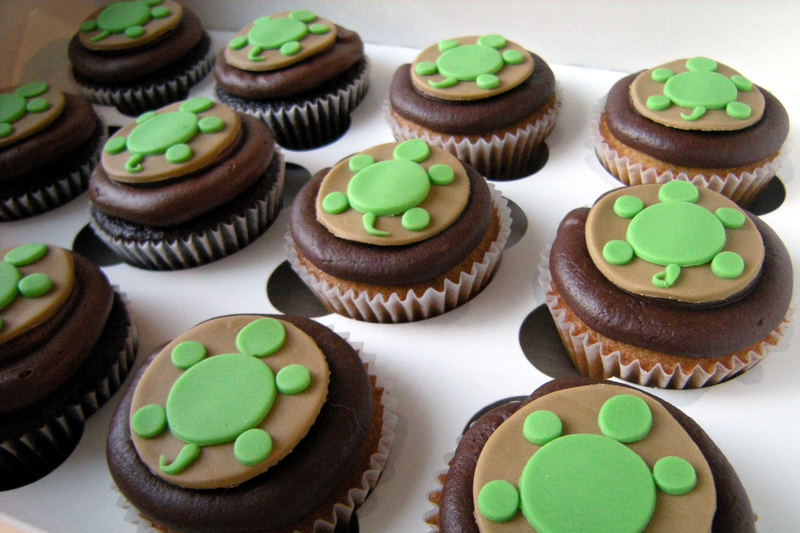 She asked if I could top the cupcakes with little turtles and though I don’t own (and couldn’t find online) a small turtle cookie cutter, I was sure I could use what I did have to come up with something cute! I tinted some plain white fondant light brown and green. 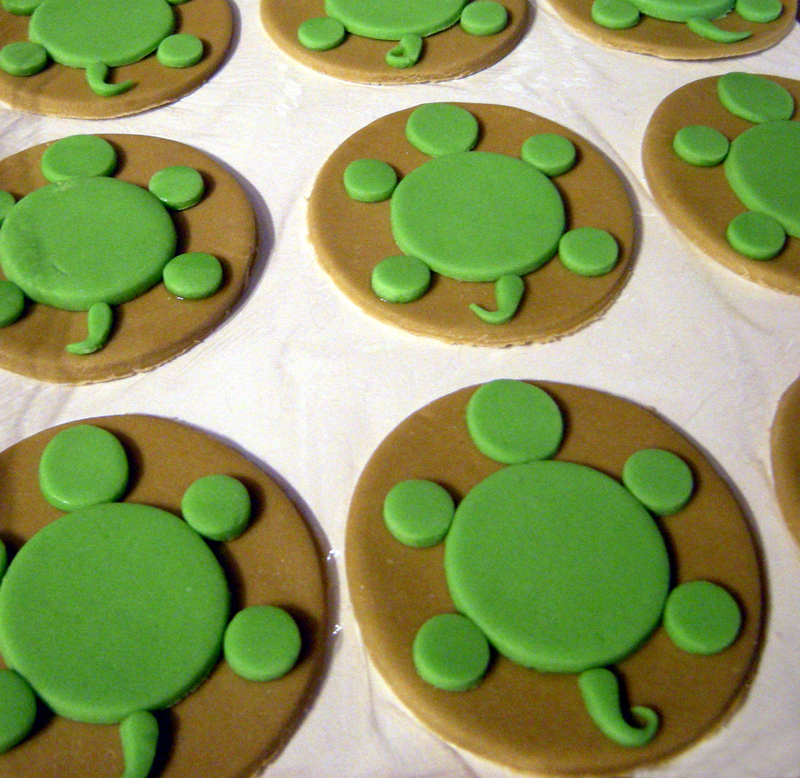 I used various icing tips (and upside-down icing tips) to cut out the shapes I would need to create the turtle. I used the lid on my container of toothpicks to cut out the perfect size brown circle for the background. I am nothing if not resourceful! For the actual cupcakes, Tyler asked for chocolate chip cupcakes with chocolate ganache, and chocolate cupcakes with chocolate buttercream…oh my! Someone is a chocolate lover! I was excited to make the chocolate chip cupcakes because that was a new one for me. I used a recipe from Annie’s Eats. 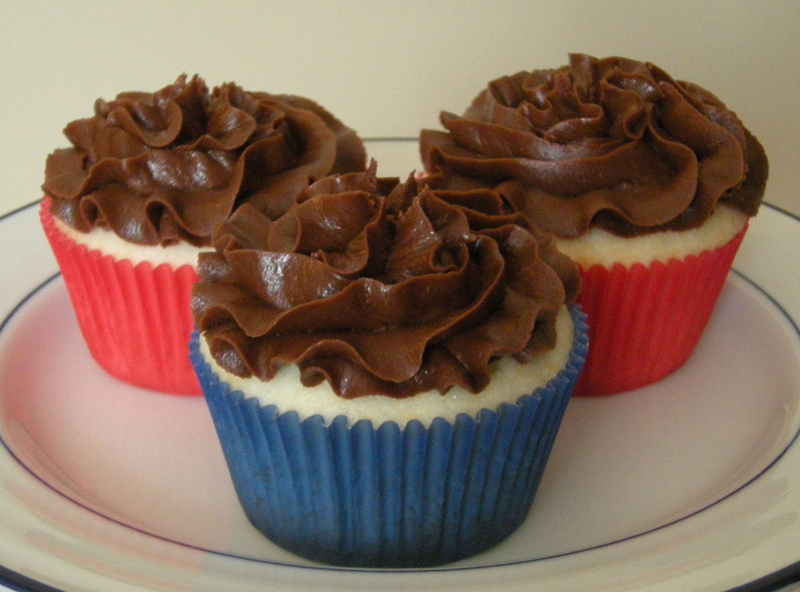 This recipe is for chocolate chip cookie dough cupcakes, but I just used the cake recipe. Honestly, I thought they were good, but VERY buttery – probably too much so. For the chocolate cupcakes, the chocolate ganache icing, and the chocolate buttercream I used recipes that I have used before. I purchased an extra large round icing tip (2A) intending to pipe giant blobs of frosting on each cupcake. But, can you believe it, the tip wasn’t big enough! I must need a really HUGE one for those blobs. 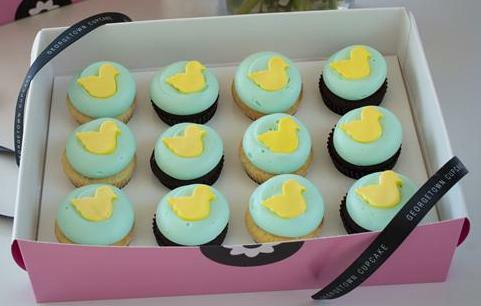 Side note on the blobs: I see this on a lot of bakery cupcakes and I honestly thought, how boring. I mean it’s just a big blob of icing (have I used the word “blob” enough?). But I must admit that when tasked with actually piping a giant blob (one more time, sorry) it was harder than I thought! I ended up using my 2A tip to pipe rings of icing on the cupcakes that were then covered with the little turtles. The effect was pretty similar so I was pleased with it. I have 3 cakes to do in the next 6 weeks so I thought this weekend would be a good time for some practice. I had a list of 5 different things that I wanted to test out – mostly things that I will need for my upcoming cakes – so I whipped up a batch of cupcakes to help me out. First, Almond Cake. I used this recipe from Wilton for a basic white cake (which I had not made before) and replaced the vanilla extract with almond extract. I quartered the recipe and came out with an even dozen cupcakes, so I can only assume the full recipe would yield 4 dozen (!). Next up was, Raspberry Filling. 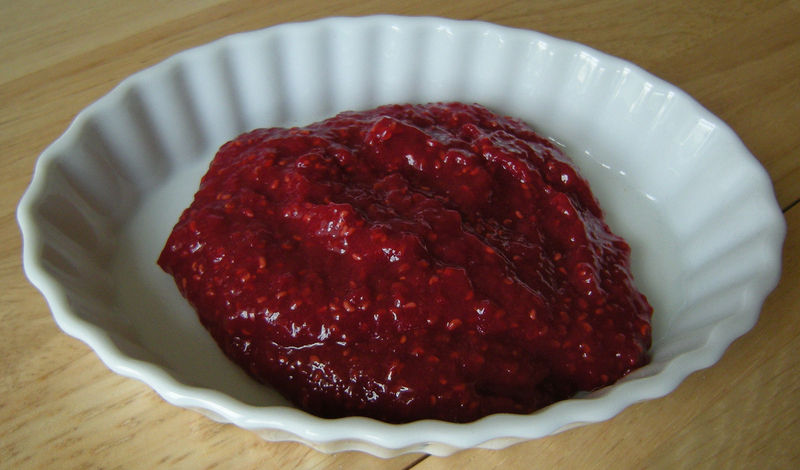 I have made cakes with raspberry filling before but I have always used seedless raspberry preserves out of a jar. They are delicious, but slippery and tend to bleed through the cake, so I thought I’d try my hand at a homemade filling. I picked this recipe at random and I found it to be easy and tasty. I halved the recipe and got a little more than a cup of filling. The only downside to this was that it was not seedless. 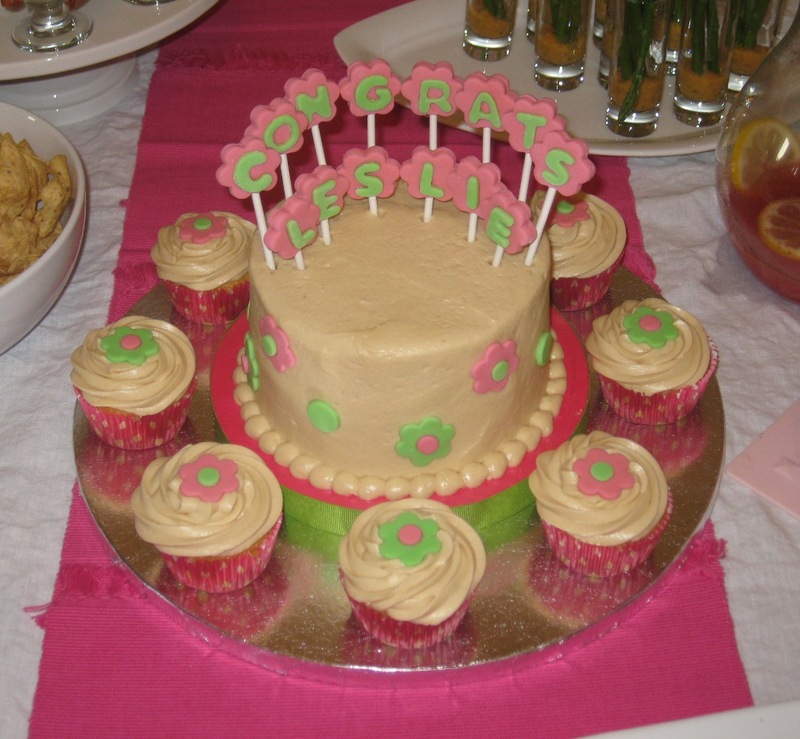 My next step was Filling the Cupcakes – another first for me. I cut into each cupcake on an angle and sliced a circle out of the top. 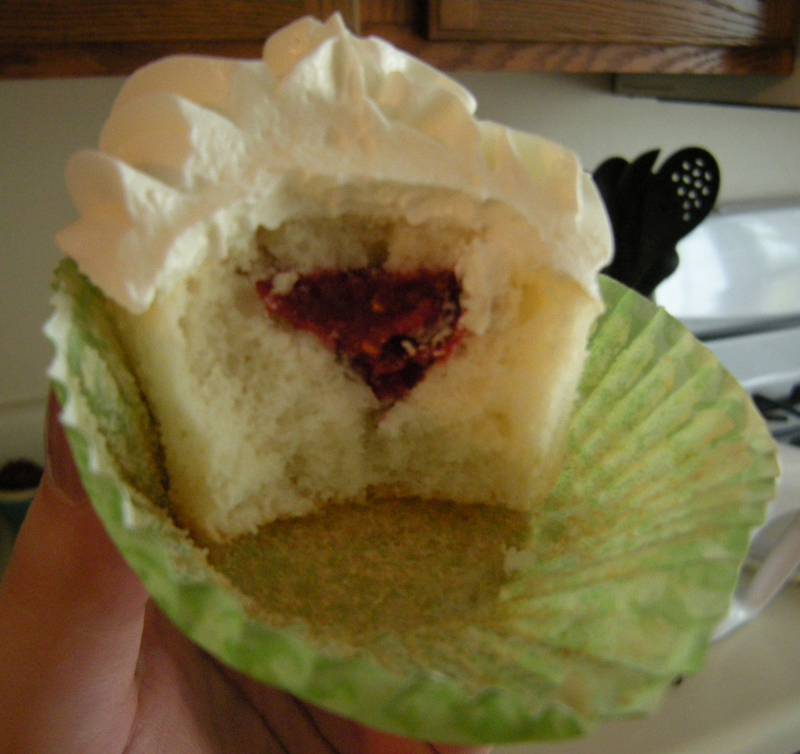 I just used a Ziplock bag with the corner cut off to pipe the filling into the cupcake, and then I replaced the top. Cinchy! Now for icing. First up was Dark Chocolate Ganache. The family friend who made my brother-in-law’s wedding cake (and mine also!) used this icing on their cake and it was SO good. She kindly shared the recipe with me and I whipped up my first ganache. Delicious!! Finally, I wanted to try an Amaretto Buttercream. I ended up with sort of an adapted Swiss Meringue buttercream. 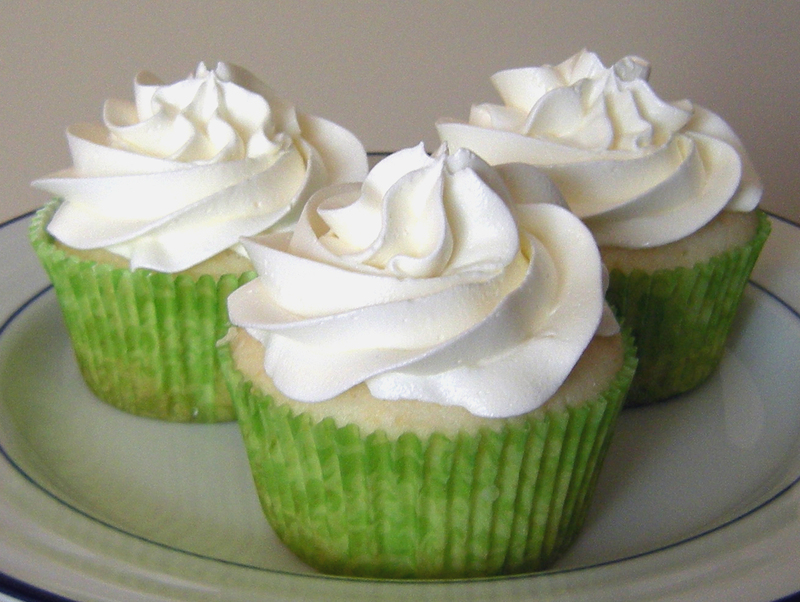 I started with the same adapted recipe that I used for the Margarita Cupcakes (Annie’s Eats, adapted from Martha Stewart’s recipe). I had planned to replace the tequila and lime juice with amaretto. Except that I didn’t get around to stopping by the liquor store. So I used some almond extract instead. It turned out well. Next time I will not be so lazy and I’ll pick up some amaretto! 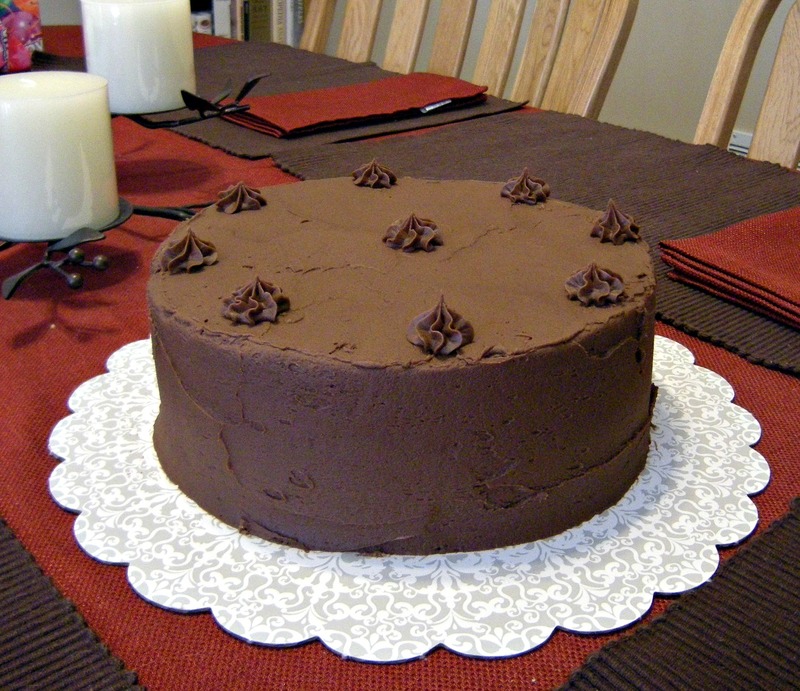 You are currently browsing the archives for the Dark chocolate ganache category.